New in Azure Stream Analytics: Geospatial functions, Custom code and lots more! Starting today, customers can easily build solutions for scenarios such as connected cars, fleet management, and mobile asset tracking with tremendous ease using Azure Stream Analytics. Developers can now leverage powerful built-in geospatial functions in their stream-processing logic to define geographical areas, and evaluate incoming geospatial data for containment, proximity, overlap, and generate alerts or easily kick-off necessary workflows etc. These geospatial capabilities are in alignment with the GeoJSON specification. We had more than 100 customers using these Geospatial capabilities in preview, including NASCAR. Established in 1947, NASCAR has grown to become the premier motorsports organization. Currently, NASCAR sanctions more than 1,200 races in more than 30 U.S. states, Canada, Mexico and Europe. NASCAR has been a pioneer in using geospatial capabilities in Azure Stream Analytics. 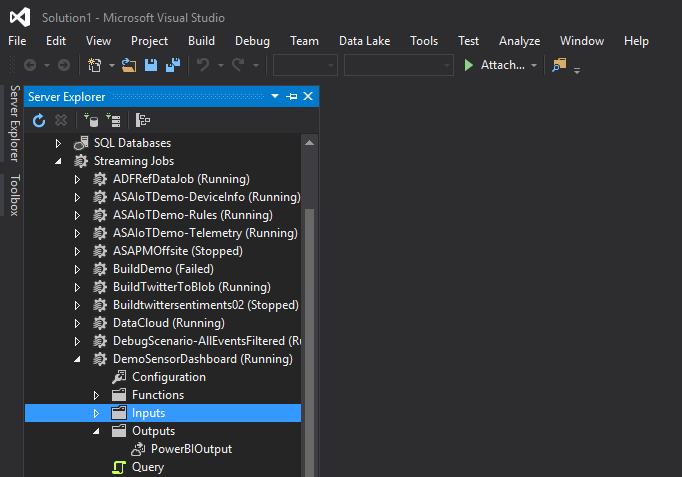 To help maximize end-to-end developer productivity across authoring, testing and debugging Stream Analytics jobs, we are rolling out a public preview of Azure Stream Analytics tools for Visual Studio. Local testing on client machines to enable true offline query building and testing experience will be one of the key capabilities that will be available. Additionally, features such as IntelliSense (code-completion), Syntax Highlighting, Error Markers and Source control integrations are designed to offer best in class developer experiences. 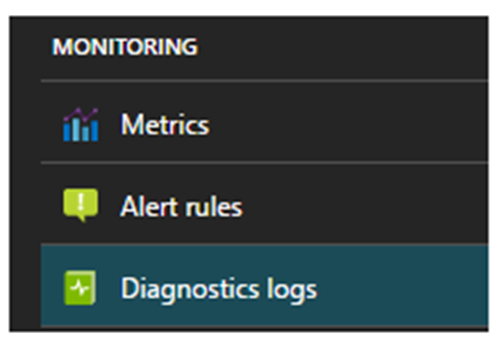 In our quest to continually test the boundaries of performance and latencies to serve our customer needs better, we’ve worked closely with our Power BI engineering team to improve dashboarding experiences for solutions built using Azure Stream Analytics. 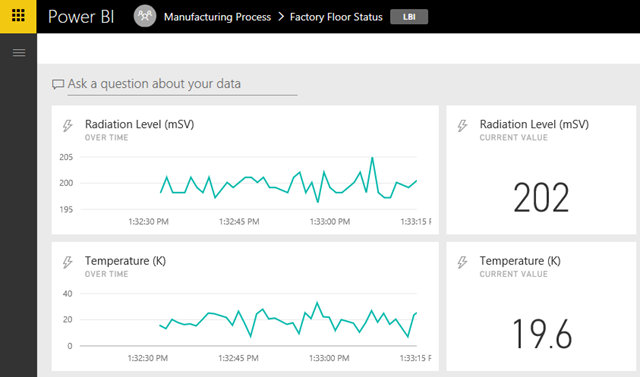 Azure Stream Analytics jobs can now output to the new Power BI streaming datasets. This will enable rich visual and dynamic dashboards with a lot lower latency than what was possible until now. 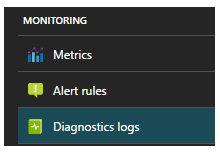 Building on a series of ongoing investments designed to improve the self-service troubleshooting experience, today we are announcing the preview of Azure Stream Analytics’ integration with Azure Monitoring. This provides customers a systematic way to deal with lost, late or malformed data while enabling efficient mechanisms to investigate errors caused by bad data. Having immediate access to actual data that causes errors helps customers quickly address problem(s). Users will be able to control how the job acts when errors occur in data, and persist relevant event data and operational metadata (eg. occurrence time and counts) in Azure Storage or Azure Event Hubs. This data can be used for diagnostics and troubleshooting offline. Furthermore, data routed to Azure Storage can be analyzed using the rich visualization and analytics capabilities of Azure Log Analytics. Key examples of data handling errors include: Data conversion and serialization errors in cases of schema mismatch; Incompatible types and constraints such as allow null, duplicates; Truncation of strings and issues with precision during conversion etc. Azure Stream Analytics team is highly committed to listening to your feedback and let the user voice dictate our future investments. We welcome you to join the conversation and make your voice heard via our UserVoice. Please visit our pricing page to review the latest pricing.